I will be giving a drop-in workshop for families at the Newburyport Public Library on Saturday, September 22, from 10 am to 12 noon. Making books is a great family activity that gives us opportunities to record our observations of the world around us and celebrate our lives. When we use recycled materials, we consume less paper and also learn to look creatively at the things we discard. There is magic in the process as we transform boxes and bags into books. The program room will be set up with four bookmaking stations with a different project at each. 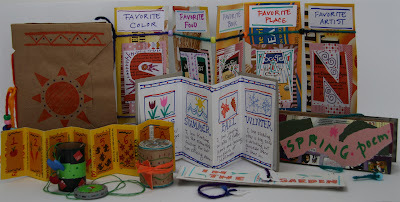 Lots of samples will be on hand to inspire continued bookmaking at home. After thirty years as an artist and educator, I am a believer in the value of exercising one's creativity for people of all ages. Bookmaking is an easy entry into creative work and I have made the process as accessible as possible. All the books are simple to construct and using recycled materials makes it affordable and easy to get started. Admission to the workshop is free but each person who plans to make books should bring 1 grocery bag, 1 cereal box, and 4-5 sheets of used copy paper with writing on one side only. This workshop is for families in Newburyport and the surrounding towns. I am working on a book proposal on this topic and would be interested in giving similar workshops at other libraries in the area. Let me know if you know a library that might be interested. Here is pdf of the flyer for the Newburyport workshop.